You should have File7 on your Desktop for the next step. Double click on File7 (Excel logo File7RADPFV5.15b your Desktop). Locate Cells A4 to F9. These cells are for setting bank parameters, tube parameters, operating parameters and model parameters. Taper: Control Cells for anode taper are normally inactivated by typing 0 (number zero) in Cell H7. Ensure that H7 is filled with 0 (number zero); unless anode taper feature is needed. One Click Device: This control cell R4 allows choice of a specific plasma focus using numbers; currently 3 machines are available chosen with numbers 1,2 or 3. Ensure that R4 is filled with the number 0. Cells A10-G13: computed characteristic quantities of the configured plasma focus. Cells H15-N16: computed durations of axial phase, radial phase and pinch phase. Joule power, radiation powers, Joule and radiation energies, plasma self-absorption correction factor, surface-mode radiation, specific heat ratio and effective charge number etc. Each computed quantity as a function of time is displayed in a column. The quantity corresponding to each column is described in Rows A18 & A19. After a run each of these columns is typically filled to several thousand cells. An additional Fig on the right displays the specific heat ratio and effective charge number. As a first exercise we configure the UPFL (Universal Plasma Focus Lab) so it operates as the NX2, the Hi-rep neon focus developed for SXR lithography in Singapore. In Fig 3 is superimposed a current waveform (in blue; you do not have this waveform) of the plasma focus short-circuited across its input end insulator with the current waveform (pink) you have just computed [see your worksheet Fig.2.] (In a later session you will learn how to do the short-circuit computation and superimposition). 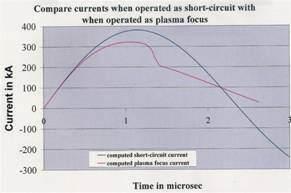 Note 1 :The first important point to stress (and one that should never be forgotten) is that the plasma focus current waveform is very much distorted from the damped sinusoid of the L-C-R discharge without the plasma focus load (Fig 3). The ‘distortions’ are due to the electrodynamical effects of the plasma motion, including the axial and radial dynamics and the emission of SXR from the Neon plasma. The way we use the code is based on the premise that the features of these ‘distortion’ contain the information of the plasma electrodynamics. Note 2: As an example we may estimate the effect of one of the electrodynamical effects. The quantity (1/2)*(dL/dt) is a dynamic resistance. In the axial phase L=(m/2p)*ln(b/a)*z where m is permeability and z is the position of the current sheath. Differentiating, 0.5*dL/dt= 10-7 *ln(4.1/1.9)*axial speed~0.8 mW per 10^4 m/sec axial speed; or 0.8mW per unit speed of cm/ms. At the peak axial speed of 6.6cm/ms (see Fig2 of worksheet), that gives us a circuit loading of ~ 5 mW; which is reduced to 3.5 mW when we consider the effect of the current factor. This is more than the loading of the stray resistance ro of 2.3 mW. So the axial motion of the current sheath is an important loading to the circuit. Note 3: Continuing along this vein we may estimate the dynamic resistive loading of the current sheath motion in the radial phase when L=(m/2p)*ln(b/rp)*zf, where rp= radial piston position and zf= length of the elongating column; both rp & zf changing with time. dL/dt~280 mW ; giving us (after considering current factor of 0.7) still around 100 mW of dynamic resistive loading due to the current sheath motion. This dynamic resistance (compared to ro of just 2.3 mW) dominates the current profile at this stage. Note 5: As a separate exercise which you may like to do one day: What is the basis for saying that (1/2)*(dL/dt) is a dynamic resistance? Can you show this by examining the power term in the situation when an inductance is changing? Compare the total power flow:(d/dt)(0.5*L*I^2) and the inductive power flow: VI=I*(d/dt)(L*I). What do you notice? Remember we are operating a Neon plasma focus. Fig 1: Computed current trace; One point of interest is to locate the ends of axial and radial phases on this trace; as well as the start and end of the pinch phase. To do this, select Fig 1 (by pointing cursor on Fig 1 and clicking). Then point cursor arrow at trace near peak and move until point 1.17us appears; that is the end of axial phase which is also the start of the radial phase. Note that this point occurs not at the start of current rollover (start of dip), but a little before that. There is no distinct indication on the trace that precisely marks this point. The start of the rollover occurs a little after the end of the axial phase. Next locate point 1.408 which is the end of the radial phase. Also locate the point 1.38 which is the start of the pinch phase. There is no clear indication on the trace to mark this point either. Fig 3: Select Fig 3. Read from dark blue curve that piston hits axis (radius=0) at 178ns after start of radial phase; and outgoing reflected shock (light blue) hits incoming piston (pink curve) at 210ns at radius of 2.1mm. The pinch phase starts at this 210ns and ends at 236 ns at a further compressed radius of 1.48mm. Fig 4: Computed waveform of tube voltage during radial phase. The current waveform is suppressed from this figure as otherwise the tube voltage will be too small to be seen on the same scale. Fig 5: Select Fig 3. Note from the dark blue curve that peak radial shock speed is 20.6 cm/us just before the radial shock hits the axis at 178 ns after start of radial phase. Also read from the pink curve that peak piston speed is 14.2 cm/us reached just before the radial shock reaches its peak speed. Yellow curve shows column elongation speed. Other Figs: Select Fig 6; and read the peak temperature reached. Select Fig 7; and read the various energies. Q1. The peak temperature reached is ? K.
Q2: At that temperature the effective charge number (from small fig) is ? ; and specific heat ratio is ? . We used properly fitted model parameters. [fitting model parameters will be covered in a future session]. We noted that the current waveform is distorted from the sinusoid-like waveform when circuit is short-circuited. 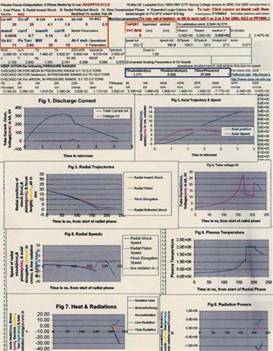 We studied the computed results, including total current, tube voltage, pinch current, radial and axial trajectories, radial and axial speeds, plasma temperature and plasma Joule and radiation energies. We also located various points on the current trace including: end of axial phase/start of radial phase; end of radial phase; start and end of pinch phase.